Have you already started pulling your hair out over holiday shopping AND shipping? We can totally commiserate with you here at ReStockIt. Not only do we have to make sure our customers get their orders in time, but we all have to make sure our families get their packages too! Here are some helpful tips to get you and your business on the right track for holiday shipping! Let your delivery driver know your game plan: No matter which carrier you use, let them know if your hours are changing or how much volume you expect to ship out. A forewarned driver is a prepared driver. Make sure packages are ready at pick-up time: Drivers want to go home too, so if you’re ill-prepared for them, you’ll put a kink in their day. It’s the holidays! There should be no kinks! 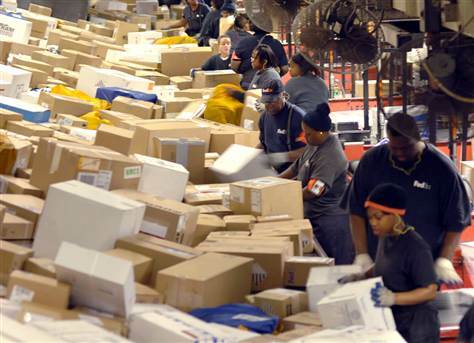 Package protection: UPS, FedEx, USPS…they are all kicked in high gear during this time of year. They are pushing packages through sorting facilities and hubs like they are going out of style-so if one of your packages gets dropped…then kicked…then finally picked up, you have peace of mind knowing you packed it like it was Fort Knox in a box. Organization and you: Let’s face it. You probably use multiple carriers. Eh, it happens. Make sure you have your packages organized by carrier, placed where they need to be, and are ready to go. Don’t Stress! This is a no-brainer. Holidays are busy times, and we all tend to start pulling our hair out by the time Thanksgiving rolls around, but if you plan now, you can avoid the stress of making sure your customer, and you, are stress-free for the holidays. For your sanity, we have included some links for shipping calendars from the Big Three Carriers.